Frequently domesticated and included in exotic bird collections, the helmeted guineafowl is an easily recognizable bird and the most widespread game bird in Africa. In other parts of the world, feral and farm populations of these birds can be frequently seen and escapees are regular, making it worthwhile for birders to recognize this distinctive and striking bird. Markings: Male and female birds are similar with overall black or dark gray plumage with a dense, even pattern of small white spots. On the wings, the spots are elongated to fine short bars. The neck is grayish black and may show a scruffy nape. The face is bare blue skin with bright red wattles at the base of the bill. The crown is topped with a horny brown or orange-brown “helmet” with a triangular horn shape. The thick legs and feet are gray. Juveniles have similar markings but their wattles and horn are less developed and the overall colors are more grayish brown with whitish-buff spots. There are multiple subspecies of helmeted guineafowl and each one shows variations in size, as well as helmet and wattle differences. Domesticated birds have many other color variations, including pied, white or gray birds. These large birds prefer open, dry grassland and savannah habitats with scattered trees or shrubby cover, and they are often found in agricultural areas as well as suburban parks or gardens. Helmeted guineafowl typically avoid dense habitats such as thick forests or marshes, and they are also absent from the barest deserts. Their native range includes all suitable habitats in sub-Saharan Africa, but they have been successfully introduced in many regions worldwide, including western Yemen, southern France, Australia and Brazil. Birds that have escaped from domesticated or exotic flocks can be seen nearly anywhere and may establish small feral populations. These birds have a harsh, cackling “kek-kek-kek” call that has a dry tone. This call is repeated at a steady tempo, though the tempo can increase to indicate urgency or alarm. The call is loud and can carry significant distances. Helmeted guineafowl are relatively social, gregarious birds, particularly in winter when flocks of hundreds may assemble for roosting and foraging. During the breeding season, groups are smaller and may be just a mated pair of birds, accompanied by their offspring after hatching. These birds roost in trees but during the day prefer walking to flying, though they will take flight if threatened. Helmeted guineafowl also take frequent dust baths to keep their plumage in peak condition. These birds are frequently domesticated and kept as companions to other domestic poultry. Because they eat large amounts of insects, they are useful at controlling pest populations, particularly ticks. They can also be useful to warn other poultry about nearby hawks or other threats with their loud, raucous calls. These birds are typically monogamous, and their courtship behavior includes males engaging in aggressive, even deadly fights and chases to impress females. The nest is a shallow scrape on the ground, usually in dense grass or vegetation, and it may or may not be lined with fine grasses. The oval-shaped eggs can be nearly pointed on the shorter end, range from whitish to tan in color and are evenly speckled with brown flecks. There are 6-15 eggs per brood, and the female incubates the eggs for 25-30 days. After hatching, the precocial chicks – called keets – are able to leave the nest rapidly and forage for themselves. The male parent does the majority of care for the chicks for the first 10-14 days while the female recovers from the incubation period. Young birds stay with their family group for 50-75 days before becoming increasingly independent, but may remain near the group until the next breeding season. These birds will visit backyards in suitable habitats if ground feeding areas are available, especially if cracked corn or millet is offered and if sufficient scrub cover is nearby for security. In the field, they often forage along roadways where grain may be spilled. They are also popular birds in zoos and aviaries worldwide. 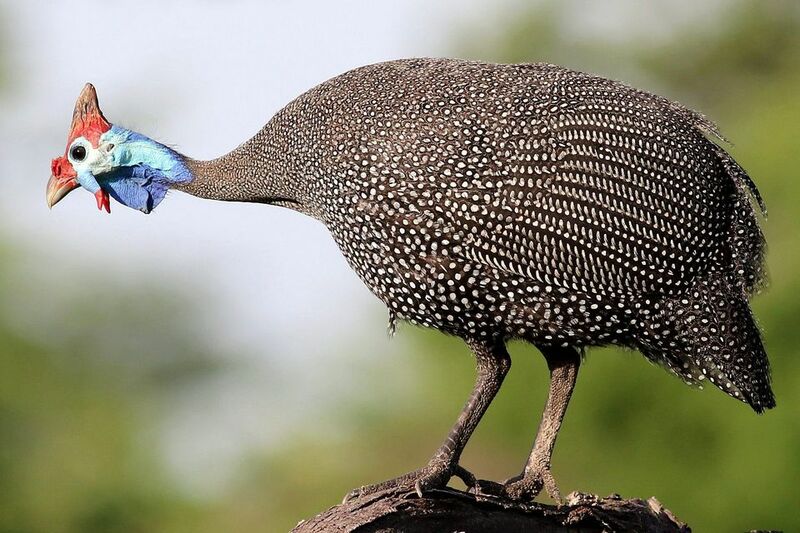 Helmeted guineafowl are not threatened or endangered, and in fact their range and population numbers are increasing overall as agricultural areas increase and provide more suitable habitat. These birds are vulnerable to being poached for food or attacked by dogs and cats, however, and they are occasionally persecuted by farmers who perceive them as a threat to grain crops.